This Chardonnay is made from a single vineyard planted in 2004 on a southeast-facing slope. This Chardonnay clone is 95C and the soil type is calcareous. The vines are trellised and under drip irrigation. The selection process for this special cuvee already started with the identification of this specific vineyard and working at it with special care from pruning right through to harvesting ensuring a low yield (not more than 8 tons per hectare) with premium quality fruit. The grapes were picked by hand. After crushing only the free-run juice was selected and after settling the clean juice was taken directly to new 300 liter French oak barrels where it was allowed to naturally ferment (wild yeast) till dry. After alcoholic fermentation which took 4 weeks the barrels were tasted and only those showing the most potential were left to mature for a further 8 months on the primary fermentation lees. Malolactic fermentation was not allowed. After maturation each barrel was tasted again, scored and rated and only the finest were selected for this special release. This is truly a selection of Rietvallei finest. Bottling commenced on 15 October 2014. You must add a minimum of 6 Bonnievale Sauvignon Blanc's to your cart. 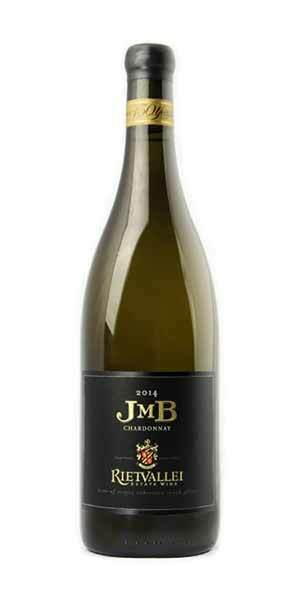 Rietvallei JMB Chardonnay is a full-bodied, complex wine with excellent fruit and wood integration. Lots of work in the vineyard and minimal interference in the cellar allows this wine to express its terroir to the fullest. A complex nose rich in citrus aromas complemented by some spicy, toasted oak notes. The palate is rich and creamy with a mixture of ripe orange, lemon and lime flavours. The oak is well integrated and only evident on the background and together with a firm acidity makes for a lingering finish. Bright lime green hue. hints of peach, marmalade and orange blossom on the nose. Green apple fruit flavours on a full creamy palate. Calling card: only very lightly oaked for everyday drinking.